For our own sanity and wellbeing we decided that today we would have a full day off to relax and sort out our gear. Although the hostel is a major drain on our budget, we really needed to get our gear clean and dry. Despite the forecast showing rain all day, the sun was shining with only a few clouds in the sky, so finally we were able to see the scenery around us. After a lazy start we managed to acquire some maps and planned a hike into the surrounding hills. With Tom and Alec, two people we met last night from the UK and Holland, we headed off to an old ww1 fort situated about 300m up on the flank of a hill a few km from where we are staying. It was built in 1915 as an artillery and observation post by the Austrians in preparation for the Italian attacks, so had an amazing view down the valley. The large gun emplacements and walkways are now overgrown and home to a wide variety of bugs and lizards. 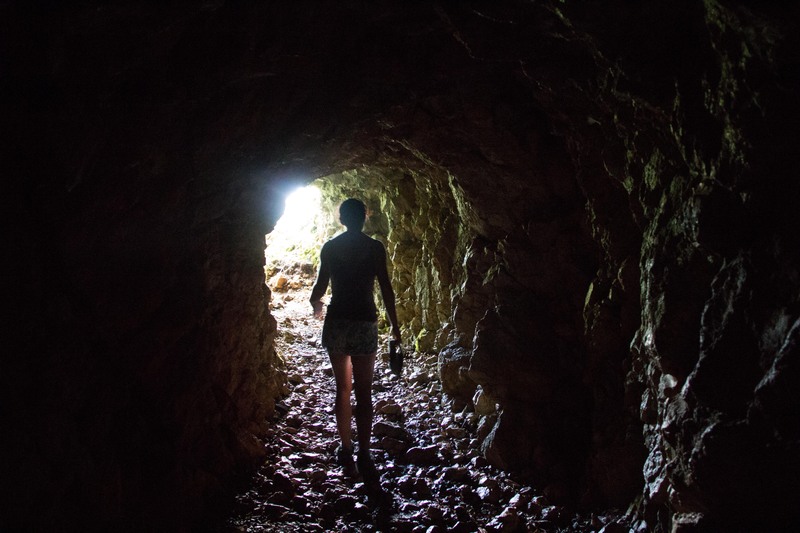 Due to Italian bombardments the Austrians build a large network of tunnels underneath to take the guns into. Despite Sheena wanting to find them first, I’m afraid I did…. We explored with our torches and were amazed by their expanse. Finding a collection of bones and metal artifacts placed on a large rock added to the mysteriousness and sombre atmosphere, the effort required to build this and then the 3 years of slaughter that occurred were hard to imagine in the now picture perfect valley. 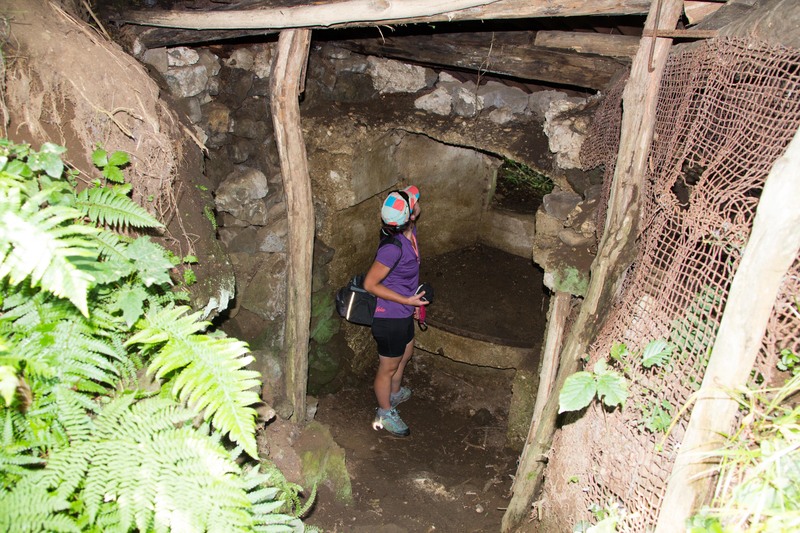 Sheena in an old dugout at the Ravelnik Austrian defences. 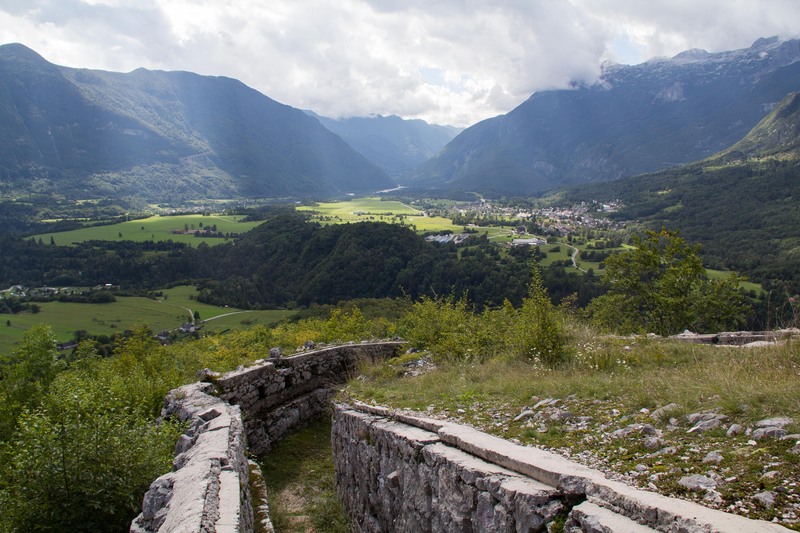 The Celo Austrian gun emplacement overlooking Bovec and its valley. Sheena being interviewed by the local TV channel. The Isonzo front is not something I had heard of before, but at the same time as we were sending hundreds of thousands to die in the mud of northern France, the Italians thought it was a good idea to continue to send endless men to attack heavily defended mountains in Slovenia, then part of the Austro Hungarian empire. 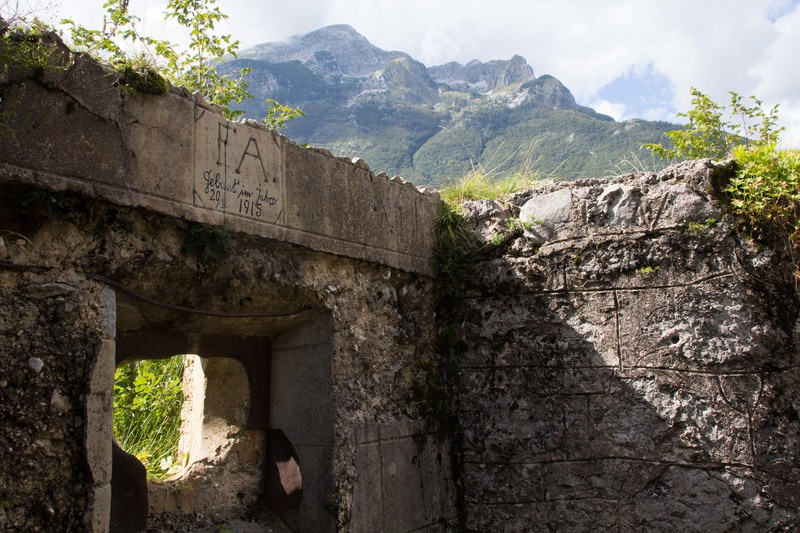 The region had been secretly assigned to the Italians at the Treaty of London in 1915, and despite the Austrians having over a year to plan and build defenses in the area, the Italians decided to attack this region of mountainous terrain. Essentially, to get anywhere the Italians had to descend a valley that was blocked at one end by large mountains covered in Austrian fortifications. They then had to cross a large river that liked to flood, climb the mountains and then win before they could proceed. Of course to cross the river they had to remove the defenders from the mountains, but to get to the mountains they had to first cross the…. You get the idea. Although continuous fighting occurred, events in the area have been described and catagorised into twelve battles. After first trying to attack the Italians built defenses at one end of the valley, during the following three years they then proceeded to launch eleven offences to try and make ground. No fancy tactics here, just full frontal assaults each time with limited or no ground being made each time. In October 1917, with the help of their Teutonic northern buddies and gas, the Austrians broke through the Italian lines. Knowing their gas masks were only effective for two hours, many routed leaving the area undefended. With the new German tactics of stormtroopers and mines, the Italians were broken, allowing the Germans 16 miles in the first day – an epic achievement at the time. The Italians retreated to the Paive River where extended supply lines and Italian counter attacks led to the attack petering out. Essentially over the whole time absolutely nothing was achieved except about a million people being injured or killed, perhaps slightly over simplified but at the end of the war the Austro Hungarian Empire was taken apart and Italy gained little, especially after its forays with fascism a few years later. One thing I couldn’t find out was what happened to all the bodies, unlike France, there is little or no soil. Bare mountainous rocky ground must have been lethal with the continued shellfire, and there was no mud to churn up and become saturated to take in the remains. I imagine the wildlife was well fed. The pass we crossed yesterday was built during this time to supply Austrain troops using Russian prisoners of war. Conditions were grim as many died through mistreatment, malnutrition or winter conditions. 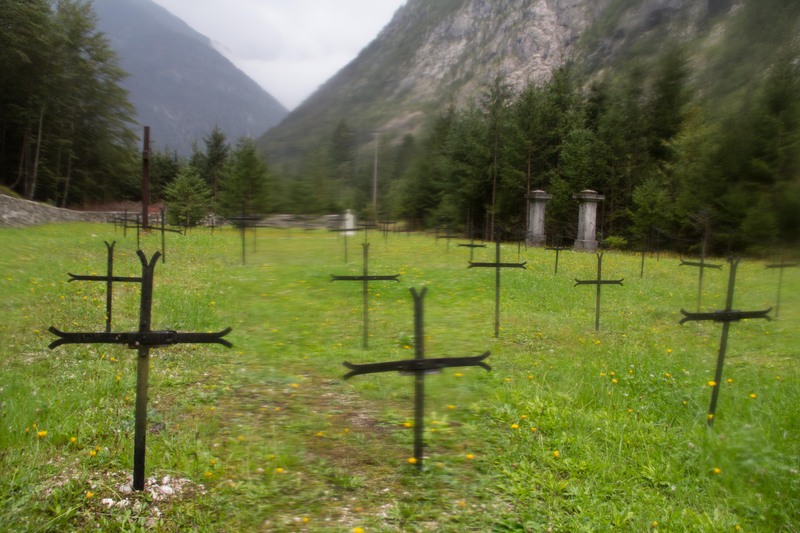 Avalanches continued to be a problem and we passed a number of small graveyards with nothing but a few rusty decaying black metal crosses, only some with scratched names on them. Old Austrian graves have been removed, yet the remains of fortifications and defenses are all over the landscape. Not only is Slovenia a beautiful place to visit, but there is a lot of interesting history to understand and learn, all of which is new to us. I best leave it at that before I write too much! ← The smell of cycling.